As President, Trump Will Appoint Labor Board That Regulates His Hotels He'll soon get to name members of the National Labor Relations Board, the agency that hears disputes involving his businesses. "We have never seen a situation like this," a former NLRB chief says. 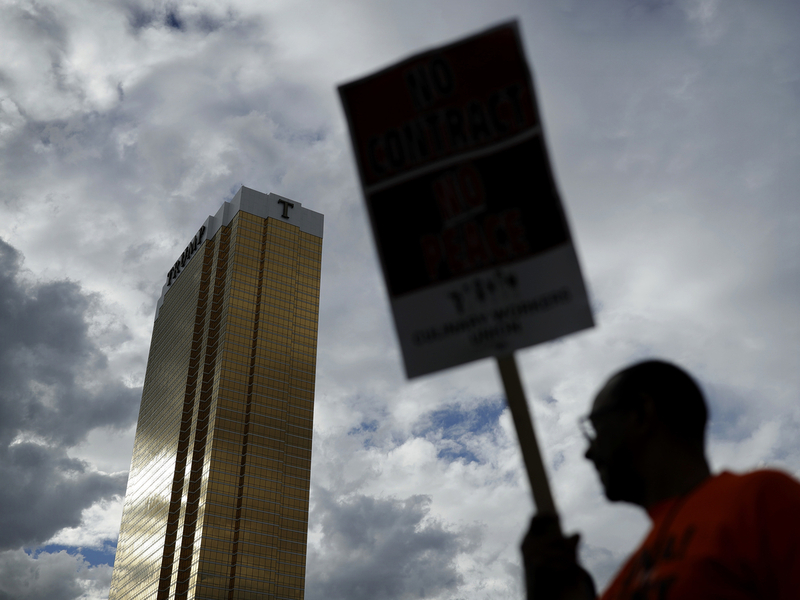 A demonstrator appeared outside the Trump International Hotel in Las Vegas last September, during a protest by the Culinary Workers Union. Like other business owners, President-elect Donald Trump has often had a strained relationship with labor unions, sometimes resulting in regulatory disputes and legal battles. Unlike the others, Trump will soon get to appoint the people who run the agency that hears many of those disputes, the National Labor Relations Board. "We have never seen a situation like this in the 81-year history of the board, where the president who appoints parties has had a financial interest in a matter coming before the board," says William Gould, former NLRB chairman and professor emeritus at Stanford Law School. As president, Trump will be able to name three of the five members of the NLRB, and after next year, he will also get to appoint the all-important general counsel, who decides which cases are heard by the board. Trump is familiar with the agency already. Like other real estate developers, he has a history of NLRB complaints over labor practices, including some that are still pending. One of the most prominent cases occurred this year, when employees of the Trump International Hotel in Las Vegas sought to become members of the Culinary Workers Union. Trump fought the effort at the NLRB, and when he lost he appealed the board's decision in federal court. The union retaliated by organizing a boycott of Trump properties. "The Culinary Union has fought against billionaires before," says union spokeswoman Bethany Khan. "But we've never fought against somebody who was running to become president of the United States of America, and that put us in a complicated position." On Wednesday, the union announced that it had reached a settlement with Trump at the Las Vegas hotel and at a separate hotel in Washington, D.C. Trump agreed to let the workers join the union and essentially gave them the same wages and benefits enjoyed by other hotel workers. The decision to settle allows Trump to put behind him a case that threatened to damage him politically. As a candidate Trump actively portrayed himself as a champion of working people, and the agreement underscores the delicate dance he will need to do to keep their support. "Our hope is that he understands that you can be pro-worker without promoting and expanding the powers the government has given to organized labor," says Patrick Semmens, vice president of the National Right to Work Foundation, which opposes compulsory unionization. Trump deserves some credit for attempting to put the union dispute behind him, says ethics advocate Meredith McGehee of Issue One, a nonpartisan advocacy group that seeks to reduce the influence of money in politics and government. But Trump needs to go a lot further to address the many conflicts of interest posed by his vast business interests, McGehee says. "It's really important to keep your eye on the ball, in terms of how he's going to deal with these conflicts of interest, whether or not he's going to set up the blind trust and show the American people that their interests are first, not his family's or his business interests are first," she says.